Claes Oldenburg and Pat Muschinski, Snapshots from the City, Judson Memorial Church, New York City, 1960. In the wild and anarchic years of the early Happenings, anything was possible. Anything! When life itself is the subject matter of art, there are no limits, no boundaries, no loss for material. 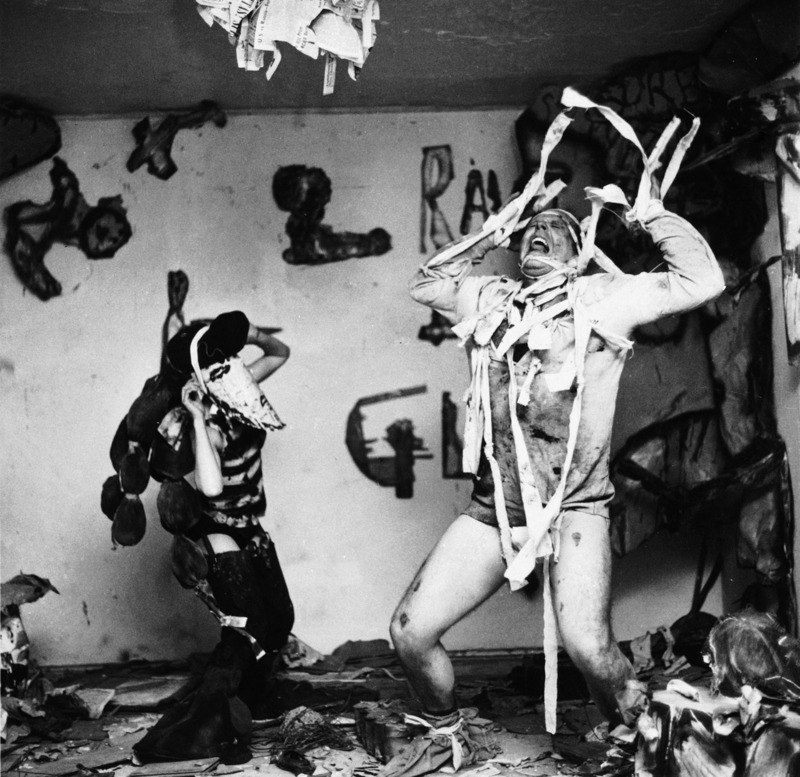 In those gritty days in the early 1960s in NYC, the artists who congregated in the Lower East Side: Robert Whitman, Claes Oldenburg, Allan Kaprow, Red Grooms, et al… had embarked on an artistic form that was completely new. So new in fact, that their performance experiments spawned several other forms and genres, most notably, what we might (and I do!) call multimedia today. If multimedia is the synthesis of the arts, the engagement of all (or nearly all) the senses: if multimedia breaks through the disciplinary boundaries of a single medium in order to branch out and spill over the edges, than the Happenings were the authentic beginning. Now that doesn’t preclude my previous declarations regarding the 19th century Wagnerian gesamtkunstwerk and other 20th century pioneers breaking new ground in this thing we call multimedia, but the Happenings usher this history into a more modern context. But what is most remarkable about the Happenings – as demonstrated above in Claes Oldenburg’s Snapshots from the City, is the appropriation of the urban experience in all its harsh sensuality. Some might refer to this as the beginning of “pop art,” borrowing ideas, materials, gestures, etc. from popular culture, but what is more interesting, is the way in which the artists used the multi-sensory experience of the Happening as a macabre, outrageous, often chaotic and sometimes grotesque construction of life itself. There is almost a comic quality to this scene out of Snapshots from the City, transforming the derelict conditions of the Lower East Side into a bizarre representation, rendering the conditions more livable: the stylization of urban chaos into pure theatrical energy. What better way to cope with it all! Perhaps the transformative nature of live theater is the most essential ingredient of the Happenings, a dynamic that is simply not possible to invoke in a painting or a drawing or a sculpture. This is what drew the artists to performance: the “liveness” of the event is the most effective way to connect art with the events of life itself.